Magnetic sensing is a type of sensory perception that has long captivated the human imagination, although it seems inaccessible to humans. Over the past 50 years, scientific studies have shown that a wide variety of living organisms have the ability to perceive magnetic fields and can use information from the earth's magnetic field in orientation behavior. Examples abound: salmon (Oncorhynchus nerka), sea turtles (Dermochelys coriacea), spotted newts (Notophthalmus viridescens), lobsters (Panulirus argus), honeybees (Apis mellifera), and fruitflies (Drosophila melongaster) can all perceive and utilize geomagnetic field information. But perhaps the most well-studied example of animal magnetoreception is the case of migratory birds (e.g. 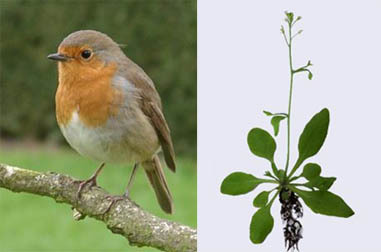 European robins (Erithacus rubecula), silvereyes (Zosterops l. lateralis), garden warblers (Sylvia borin)), who use the earth's magnetic field, as well as a variety of other environmental cues, to find their way during migration. The avian magnetic compass is a complex entity with many surprising properties. The basis for the magnetic sense is located in the eye of the bird, and furthermore, it is light-dependent, i.e., a bird can only sense the magnetic field if certain wavelengths of light are available. Specifically, many studies have shown that birds can only orient if blue light is present. The avian compass is also an inclination-only compass, meaning that it can sense changes in the inclination of magnetic field lines but is not sensitive to the polarity of the field lines. Under normal conditions, birds are sensitive to only a narrow band of magnetic field strengths around the geomagnetic field strength, but can orient at higher or lower magnetic field strengths given accomodation time. Despite decades of study, the physical basis of the avian magnetic sense remains elusive. The two main models for avian magnetoreception are a magnetite-based model and a radical-pair-based model (for review see, e.g., Solov'yov, Schulten, Greiner, 2010). The former suggests that the compass has its foundation in small particles of magnetite located in the head of the bird. The latter idea is that the avian compass may be produced in a chemical reaction in the eye of the bird, involving the production of a radical pair. A radical pair, most generally, is a pair of molecules, each of which have an unpaired electron. If the radical pair is formed so that the spins on the two unpaired electrons in the system are entangled (i.e. they begin in a singlet or triplet state), and the reaction products are spin-dependent (i.e., there are distinct products for the cases where the radical pair system is in an overall singlet vs. triplet state), then there is an opportunity for an external magnetic field to affect the reaction by modulating the relative orientation of the electron spins. How could a radical pair reaction lead to a magnetic compass sense? Suppose that the products of a radical pair reaction in the retina of a bird could in some way affect the sensitivity of light receptors in the eye, so that modulation of the reaction products by a magnetic field would lead to modulation of the bird's visual sense, producing brighter or darker regions in the bird's field of view. (The last supposition must be understood to be speculative; the particular way in which the radical pair mechanism interfaces with the bird's perception is not well understood.) When the bird moves its head, changing the angle between its head and the earth's magnetic field, the pattern of dark spots would move across its field of vision and it could use that pattern to orient itself with respect to the magnetic field. This idea is explored in detail by Ritz et al (see below). Interestingly, studies have shown that migratory birds exhibit a head-scanning behavior when using the magnetic field to orient that would be consistent with such a picture. Such a vision-based radical-pair-based model would explain several of the unique characteristics of the avian compass, e.g., that it is light-dependent, inclination-only, and linked with the eye of the bird. It is also consistent with experiments involving the effects of low-intensity radio frequency radiation on bird orientation, as suggested by Canfield et al. (see below). Fig. 2. A chain of three tryptophan residues, Trp400, Trp377 and Trp324 are involved in the photoreduction of the FAD cofactor. During the electron-transfer process, radical pairs are formed between FADH and each of the tryptophans. The formation of these radical pairs permits a magnetic field effect in cryptochrome. The question remains as to where, physically, this radical pair reaction would take place. It has been suggested that the radical pair reaction linked to the avian compass arises in the protein cryptochrome. Cryptochrome is a signaling protein found in a wide variety of plants and animals, and is highly homologous to DNA photolyase. There is some evidence that retinal cryptochromes may be involved in the avian magnetic sense. Detailed analysis of cryptochrome as a transducer for the avian compass would require an atomic-resolution structure of the protein, and unfortunately, no structure of avian cryptochrome is currently available. However, the structure of cryptochrome from a plant (Arabidopsis thaliana) is available, and the cryptochromes of plants and birds are structurally very similar. Recent experiments by Ahmad et al. (Ahmad, Galland, Ritz, Wiltschko and Wiltschko. Magnetic intensity affects cryptochrome-dependent responses in Arabidopsis thaliana. Planta 225, 615-624 (2007)) have shown that Arabidopsis seedlings exhibit a magnetic field effect. Processes involved with cryptochrome signaling (such as hypocotyl growth inhibition) are enhanced under a magnetic field of 5 G (as compared with an Earth-strength 0.5 G magnetic field). 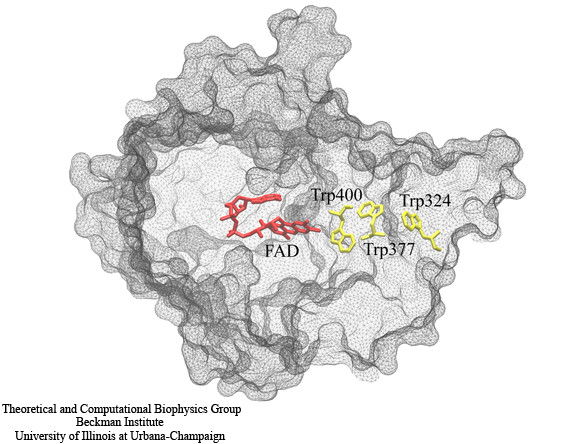 Both photolyase and cryptochrome internally bind the chromophore flavin adenine dinucleotide (FAD). In photolyase, the protein is brought to its active state via a light-induced photoreduction pathway involving a chain of three tryptophans. Studies suggest that cryptochrome also is activated by a similar photoreduction pathway. The hypothesized photoreduction pathway in cryptochrome involves three tryptophans conserved from photolyase, numbered Trp324, Trp377 and Trp400 in the Arabidopsis cryptochrome structure. Trp324 is located near the periphery of the protein body, and Trp400 is proximal to the flavin cofactor with Trp377 located in between. Before light activation of cryptochrome, the flavin cofactor is present in its fully oxidized FAD state. FAD absorbs blue light photons, being promoted thereby to an excited state, FAD*. FAD* is then protonated, likely from a nearby aspartic acid, producing FADH+. Once the electronically excited flavin is in the FADH+ state, light-induced electron transfer is initiated. An electron first jumps from the nearby Trp400 into the hole left by the excited electron in FADH+, forming FADH + Trp400+. An electron then jumps from Trp377 to Trp400, forming FADH + Trp377+, and subsequently from Trp324 to Trp377, forming FADH + Trp324+. Finally Trp324+ becomes deprotonated to Trp324dep, i.e., forming FADH + Trp324dep, fixing the electron on the FADH cofactor. The protein cryptochrome is thought to be in its active (signaling) state when the flavin is in this FADH form. An external magnetic field can interact with each of the three radical pair states (FADH + Trp400+, FADH + Trp377+, FADH + Trp324+) formed during the photoreduction process. Fig. 3. Light-induced photocycle in cryptochrome. The signaling state of cryptochrome is controlled by the oxidation state of its flavin cofactor FAD, which exists in three interconvertible redox forms, FAD, FADH, and FADH-. The FAD form is inactive (non-signalling) and accumulates to high levels in the dark. Blue light triggers photoreduction of FAD to establish a photoequilibrium that favors FADH over FAD or FADH-. The semiquinone FADH state corresponds to the signalling state of the protein. 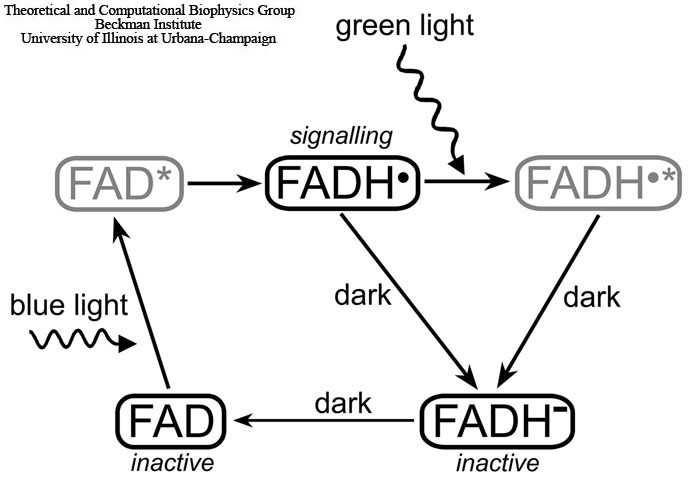 Green light photons can further be absorbed by the radical FADH and shift the photoequilibrium to the fully reduced form (FADH-), which is inactive (non-signalling). The FAD→FADH- and FADH→FADH- reactions involve an active FADH radical and, therefore, can be affected by an external magnetic field. The excited states of the flavin cofactor, FAD* and FADH*, colored gray, arise as short-lived intermediate stages of the cryptochrome photocycle. However cryptochrome's signalling state has a limited lifetime. 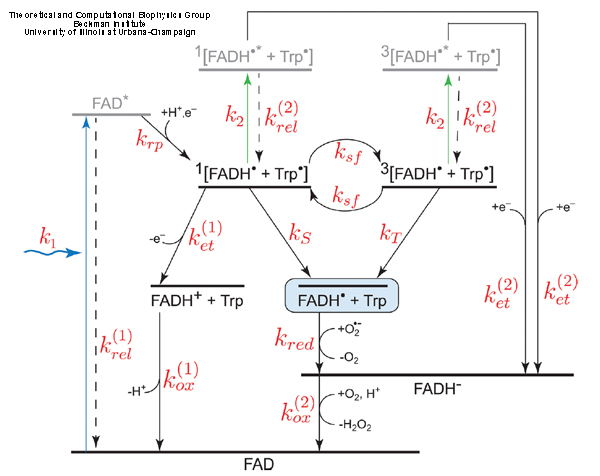 Under aerobic conditions, the stable FADH molecule slowly reverts back to the initial FAD state as illustrated in Fig. 3. This process is not well understood and occurs on the millisecond time scale. The cryptochrome back-reaction attracted considerable attention recently due to indications that it may be the key link to avian magnetoreception. In the course of the back-reaction a radical pair is formed between flavin and an oxygen molecule. The hypothesis that an oxygen molecule is involved in magnetoreception still needs to be verified experimentally. However, this idea is clearly promising because the oxygen radical is devoid of hyperfine coupling, which leads to an enhancement of magnetic field effects. In addition, such a radical pair (where one radical has no hyperfine coupling) would be consistent with studies on the effects of weak radio-frequency oscillating magnetic fields on migratory bird orientation. Ritz and co-workers (T. Ritz, R. Wiltschko, P.J. Hore, C.T. Rodgers, K. Stapput, P. Thalau, C.R. Timmel and W. Wiltschko. Magnetic Compass of Birds Is Based on a Molecule with Optimal Directional Sensitivity. Biophys. J. 96, 3451-3457 (2009)) not only found that appropriate orientation behavior depends on the strength and angle of the oscillating field, but also that the minimum field strength necessary to disrupt orientation depends on the frequency of the oscillating field in a resonance-like behavior that would be predicted by such a radical pair. Fig. 4. Schematic presentation of the postulated reaction scheme involving the flavin cofactor FADH in cryptochrome and a molecular oxygen radical (superoxide) O2-. Superoxide enters the molecular pocket of cryptochrome with a rate constant kox, forming a radical pair [FADH + O2-], which is found in a singlet (25 %) or a triplet (75 %) state, denoted by 1[…] or 3[…], respectively. An external magnetic field as well as the hyperfine coupling interaction brings about an interconversion between the singlet and the triplet states of the radical pair. If the radical pair is in its singlet state, the electron from the O2- radical can transfer to the FADH radical, forming the singlet 1[FADH-+O2] state, which has lower energy than the initial 1[FADH+O2-] state; the corresponding electron transfer rate constant is ket. The electron transfer is not possible from the triplet state of the radical pair, due to spin conservation during the transfer. The radical pair can separate, i.e., the O2- radical escapes (with a rate constant kb) from the molecular pocket before electron transfer occurs, leaving cryptochrome then in its signalling state. The non-signalling FADH- state is transformed to the FAD resting state, possibly by subsequent protonation and release of a hydrogen peroxide molecule. The back-reaction in cryptochrome likely involves the superoxide radical O2-. The superoxide radical O2- occurs widely in nature and can be obtained as the product of the one-electron reduction of molecular oxygen (O2). O2- is toxic to cells and under physiological conditions is available only in nM-ÂµM concentrations, which is well controlled by an enzyme, superoxide dismutase. The reaction of the semiquinone FADH state of the flavin cofactor in cryptochrome with O2- is schematically shown in Fig. 4. The molecular oxygen radical O2- enters the molecular pocket in cryptochrome, depicted in Fig.4, with a rate constant kox, creating a radical pair [FADH+O2-], which can be either in a singlet or a triplet state, as denoted by 1[…] or 3[…], respectively. If the radical pair is found in its singlet state, the electron from the O2- radical should transfer to the FADH radical, since the energy of the 1[FADH-+O2] state is lower than the energy of the 1[FADH+O2-] state. The electron transfer is only possible from the singlet state of the radical pair, the corresponding rate constant being depicted in Fig. 4 as ket. The triplet state 3[FADH-+O2] can only produce FADH- after it is converted to the singlet state 1[FADH-+O2]. The idea behind the magnetic field effect in cryptochrome activation reaction is illustrated in Fig. 5. Cryptochrome is brought to its active (signaling) state via the photoreduction process described above. However, cryptochrome could revert to its non-active form if ever the unpaired electron on FADH back-transfers to one of the three tryptophans. This back-transfer process is spin-dependent, as it can only take place if the spins of the two unpaired electrons on FADH and the tryptophan are in an overall singlet (antiparallel) state, rather than a triplet (parallel) state. The spins of the unpaired electrons precess about the local magnetic field, which consists of contributions from the surrounding nuclei as well as from the external magnetic field. As each of the electron spins precess, they change their orientation with respect to one another. For example, if the spins begin in a singlet (antiparallel) state, their precession will bring them out of alignment, introducing some triplet contribution. In this way, the presence of the external magnetic field can influence the precession of the electron spins and thereby influence the amount of time the spins spend in their singlet state. This, in turn, influences the probability for electron back-transfer and therefore the amount of time that cryptochrome spends in its signaling state. Computational studies on a model of the photoreduction pathway in cryptochrome have shown that the magnetic field effect described above can have an effect on cryptochrome activation. The model used in our paper of the cryptochrome's photoreduction pathway (Solov'yov, Chandler, Schulten, 2007; see bellow) makes use of realistic electron transfer rate constants and hyperfine coupling constants. Calculations involving this model predict that the magnetic field effect could alter cryptochrome's activation yield (the amount of time it spends in its active state) by approximately 10% over the range from 0 to 5 G. This is of the same order of magnitude as the magnetic field effects observed by experimentalists in Arabidopsis thaliana. The calculations also predict an angular dependence which matches the observed inclination-only magnetic sense of birds. It was also found that the magnetic field effect is highly sensitive to the hyperfine coupling constants for each nucleus; unfortunately these hyperfine constants are not known for cryptochrome (the values used in the calculation were those for the highly-similar photolyase). Also, computational constraints limited the number of nuclei that could be included in the calcualtion. Future studies should make use of exact hyperfine coupling constants (if they become available) and include all nuclei. Calculations such as this strongly suggest that a radical-pair-based magnetic sense involving cryptochrome is feasible, and this is an important first step in explaining and understanding the magnetic sense of animals. Fig. 5. Shown here is a semi-classical description of the magnetic field effect on the radical pairs between FADH and tryptophan in cryptochrome. The unpaired electron spins (S1 and S2) precess about a local magnetic field produced by the addition of the external magnetic field B with contributions I1 and I2 from the nuclear spins on the two radicals. The spin precession continuously alters the relative spin orientation, causing the singlet (anti-parallel) to triplet (parallel) interconversion which underlies the magnetic field effect. Electron back-transfer from a tryptophan to FADH quenches cryptochrome's active state. However, this back-transfer can only take place when the electron spins are in the singlet state, and this spin-dependence allows the external magnetic field, B, to affect cryptochrome activation. The external magnetic field and the hyperfine interaction affect the interconversion between the singlet and the triplet states of the radical pair in a manner that depends on the orientation in the Earth magnetic field. Once the FAD cofactor is reduced to the FADH- state, cryptochrome stops signalling, because the reaction FADH+O2-→FADH-+O2 is considered irreversible. However, before this reaction occurs, the radical pair may separate, namely, if the O2- radical escapes from cryptochrome's molecular pocket, leaving cryptochrome then still in its signalling state. The escape reaction is governed by the rate constant kb, as depicted in Fig. 4, and can occur equally likely from either the singlet and the triplet state of the radical pair, as depicted in Fig. 4. Thus, cryptochrome remains in its signaling state until another O2- radical arrives, and the FADH radical gets another chance to be reduced. The separation and re-encounter of O2- delay the magnetic field-dependent reaction, shifting it to the millisecond time scale, i.e., the time scale relevant for biological signaling. Computational studies of the radical pair-based back-reaction in cryptochrome in a weak (i.e., the Earth's) external magnetic field demonstrated that the duration of cryptochrome's FADH+O2-→FADH-+O2 reaction can be changed significantly (see Solov'yov, Schulten, 2009). Moreover it was shown that the suggested reaction can act as an inclination compass by demonstrating that a field of 0.5 G produces effects that vary significantly during reorientation of cryptochrome. The involvement of the superoxide radical in avian magnetoreception, still has to be verified experimentally, as such involvement has been corroborated so far only indirectly. The involvement of a radical pair in which one of the radical partners is devoid of the hyperfine interaction in the magnetoreception process is consistent with studies on the effects of weak radio-frequency oscillating magnetic fields on migratory bird orientation (see the recent paper by Ritz and co-workers), investigations that had been inspired by earlier theoretical work (see papers by Canfield et al. below). Another argument, that speaks for the suggested reaction is its robustness. Indeed, the suggested back-reaction is much simpler than the magnetic field-dependent reaction in cryptochrome activation process (Solov'yov, Chandler, Schulten, 2007; see below) and, therefore, is expected to function more reliably in a weak magnetic field. At a first glance, the involvement of superoxide, O2-, in the magnetic field dependent back-reaction of cryptochrome seems rather controversial. It seems odd that an organism should rely on a toxic substance for a sensory mechanism. However, one should note that superoxide arises naturally in organisms, and is well controlled by superoxide dismutase, which keeps the concentration of superoxide low. This low concentration level, though, is key to the suggested mechanism as the reaction back to the non-signalling state of cryptochrome should be slow, i.e., take about 10 ms, as corroborated by Liedvogel et al. Such slow rate of diffusion-controlled encounter is ensured through the low O2- concentration. At a concentration of [O2-]=3 nM, which is tolerable to an organism, the formation of FADH+O2- is estimated to take about 1.1 ms, which is indeed the time needed for the suggested mechanism to function optimally. It should be noted that O2- has been postulated to be involved in other biological signaling processes, as reviewed in Buetler et al. The studied models of magnetoreception have assumed that the radical pair-forming molecules are rigidly fixed in space, and this assumption has been a major objection to the suggested hypothesis. In (Solov'yov, Mouritsen, Schulten, 2010), we investigated theoretically how much disorder is permitted for the radical pair-forming, protein-based magnetic compass in the eye to remain functional. The study showed that only one rotational degree of freedom of the radical pair-forming protein needs to be partially constrained, while the other two rotational degrees of freedom do not impact the magnetoreceptive properties of the protein. The result implies that any membrane-associated protein is sufficiently restricted in its motion to function as a radical pair-based magnetoreceptor. 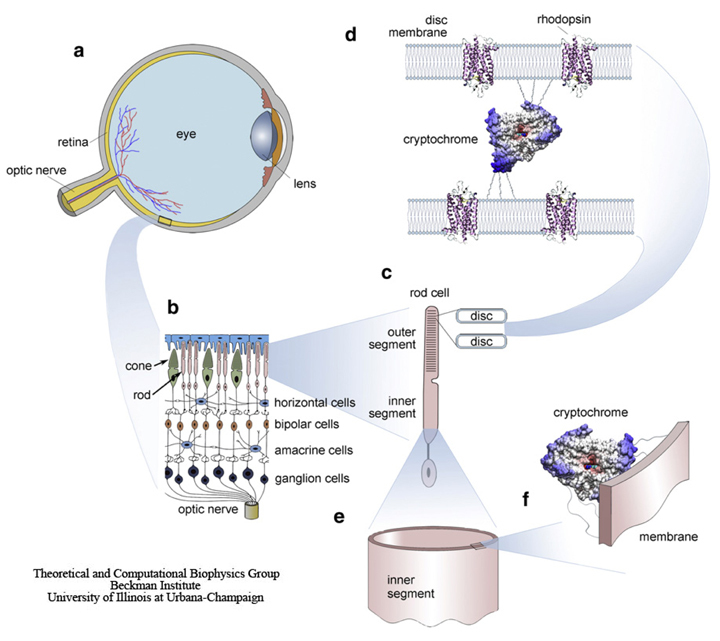 Signaling of cryptochromes may work in the eye by interfering with the normal rhodopsin-based visual process or independently from this process. However, our studies (Solov'yov, Mouritsen, Schulten, 2010) showed that for the principle results of the calculations, the exact signaling mechanism is irrelevant. All we assumed is that the currently unknown cryptochrome activation cascade involves amplification steps that result in a similar degree of amplification as known from the rhodopsin signaling cascade (see Fig. 6). Fig. 6. Schematic illustration of a bird's eye and its important components. The retina (a) converts images from the eye's optical system into electrical signals sent along the ganglion cells forming the optic nerve to the brain. (b) An enlarged retina segment is shown schematically. (c) The retina consists of several cell layers. The primary signals arising in the rod and cone outer segments are passed to the horizontal, the bipolar, the amacrine, and the ganglion cells. (d) The primary phototransduction signal is generated in the receptor protein rhodopsin shown schematically at a much reduced density. The rhodopsin containing membranes form disks with a thickness of ~20 nm, being ~15–20 nm apart from each other. The putatively magnetic-field-sensitive protein cryptochrome may be localized in a specifically oriented fashion between the disks of the outer segment of the photoreceptor cell, as schematically shown in panel d or the cryptochromes (e) may be attached to the oriented, quasicylindrical membrane of the inner segment of the photoreceptor cell (f). In mathematical terms, the vision-based compass in birds is characterized through a filter function, which models the magnetic field-mediated visual signal modulation recorded on the bird's retina (see Fig. 7). 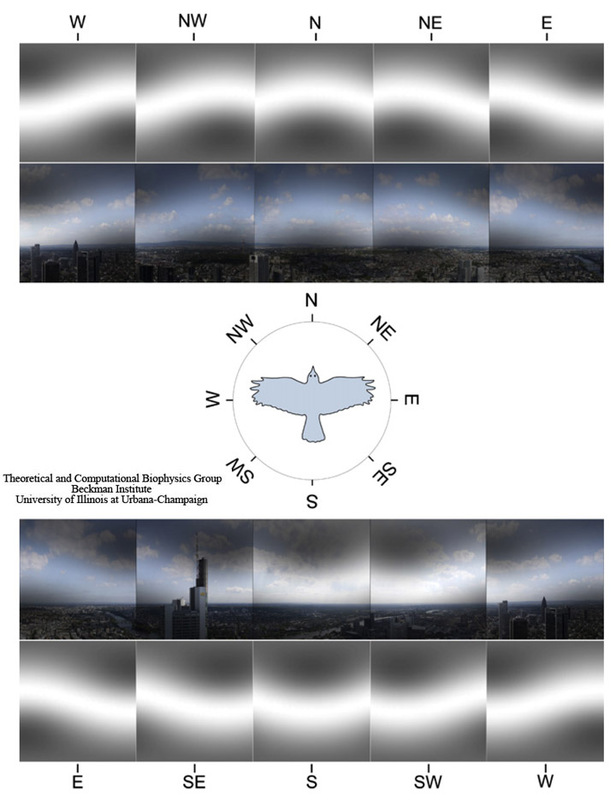 In (Solov'yov, Mouritsen, Schulten) we studied different factors that can affect the acuity of the filter function, in particular, the possibility of repetitive action of cryptochrome, and how day and night flight regimes may influence the magnetic field-mediated visual pattern on the bird's retina and, thereby, its compass sense. Fig. 7. Panoramic view at Frankfurt am Main, Germany. The image shows the landscape perspective recorded from a bird flight altitude of 200 m above the ground with the cardinal directions indicated. The visual field of a bird is modified through the magnetic filter function. For the sake of illustration we show the magnetic field-mediated pattern in grayscale alone (which would reflect the perceived pattern if the magnetic visual pathway is completely separated from the normal visual pathway) and added onto the normal visual image the bird would see, if magnetic and normal vision uses the same neuronal pathway in the retina. The patterns are shown for a bird looking at eight cardinal directions (N, NE, E, SE, S, SW, W, and NW). The geomagnetic field inclination angle is 66°, being a characteristic value for the region. Although cryptochromes have been extensively studied during the last years, the photoactivation reactions in cryptochromes from different organisms are still strongly contested. In (Solov'yov, Schulten, 2012) we have proposed a theoretical analysis method for identifying cryptochrome's signaling reactions involving comparison of measured and calculated reaction kinetics in cryptochrome. Application of the method yields an exemplary light-driven reaction cycle, supported through transient absorption and electron-spin-resonance observations together with known facts on avian magnetoreception. Transient states in cryptochrome photoactivation reaction can be revealed through the transient absorption measurements of a cryptochrome containing sample, as schematically illustrated in Fig. 8. The sample containing cryptochrome is irradiated with a pulsed laser beam (red) that generates a measurable concentration of excited states (FAD*) in the system. FAD* decays then to a series of intermediates back to FAD, while some of the intermediates being probed by the probe beam (white) are used to measure the absorption spectrum of transient species. Additionally, magnetic field effects in cryptochrome can be studied if the sample is subjected to an external magnetic field. Fig. 8. Arabidopsis thaliana cryptochrome in transient absorption experiment. The measurements of cryptochrome transient photoabsorption suggest different reaction schemes, consistent with the same experimental observations. In (Solov'yov, Schulten, 2012) we single out one reaction scheme of cryptochrome activation and inactivation, namely, the one shown in Fig. 9, and demonstrate how this scheme can be reconciled with observed time-dependent absorption spectra. The scheme incorporates the key observation that the flavin cofactor in cryptochrome is observed in three interconvertible redox forms, FAD, FADH•, and FADH-. The various rate constants shown in Fig. 9 capture the different processes underlying cryptochrome photoactivation and relaxation, assuming all processes can be described through first order kinetics. Fig. 9. Examplary cryptochrome activation and inactivation reactions. Fig. 10. Cryptochrome transient absorption spectra. Transient absorption observed at 490-550 nm reveals a double exponential decay with decay times of 4 ms and 14 ms, whereas transient absorption at 550-630 nm shows only a single exponential decay with a decay time of 14 ms. As can be seen in Fig. 10, the calculated transient absorption perfectly matches the recorded data for a 490-550 nm and a 550-630 nm probe-beam. The decay times, therefore, may be attributed to FADH (14 ms) and FADH- (4 ms). Since the molecular origins of cryptochrome photoactivation is presently unknown, and turns out to be highly speculative, in (Solov'yov, Domratcheva, Moughal Shahi, Schulten, 2012) we have undertaken the first step in revealing the molecular foundations of this reaction, involving radical pair formation through electron transfer, as shown in Fig. 11. 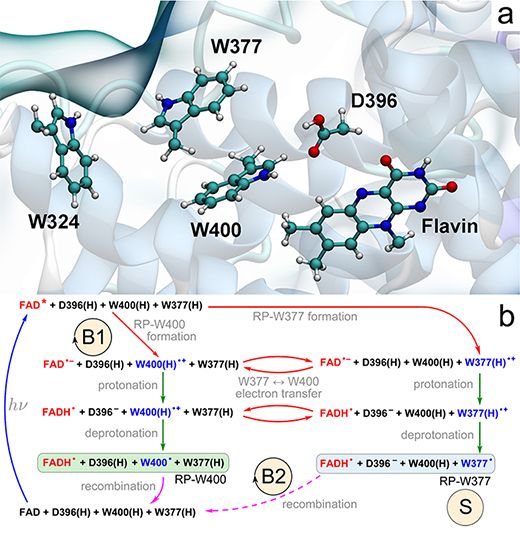 To describe this process and underlying photochemical mechanisms, we carried out a combination of quantum chemical calculations and molecular dynamics simulations on plant (Arabidopsis thaliana) cryptochrome. Fig. 11. Electron-and proton-transfer reactions in cryptochrome. (a) Flavin cofactor, the tryptophan triad W400, W377, W324 and the D396 residue forming the active site of cryptochrome-1 from A. thaliana. (b) Schematic representation of the photoactivation reaction. Cryptochrome photoactivation is triggered by blue-light photoexcitation of the FAD cofactor (blue arrow) initially present in the oxidized state. Excited flavin, FAD*, receives an electron from one of the nearby tryptophans (red arrows), either W400(H) (RP-W400) or W377(H) (RP-W377). Electron transfer from tryptophan leads to formation of an ionic FAD•- + W(H)•+ radical pair, which is then transformed into a stable neutral FADH• + W• radical pair state through proton exchange with the nearby D396 (two green arrows). RP-W400 and RP-W377 interconvert through a W400(H) → W377(H) electron-transfer process (red arrows). In contrast to RP-W377, the neutral radical pair RP-W400 recombines back to the initial state through coupled electron-proton transfer (solid purple arrow). The RP-W377 state is stabilized through W377(H)•+ deprotonation into solution and, therefore, returns to the initial state only on a very long time scale (dashed purple arrow). The reaction cycle B1 and the reaction B2 are primary candidates for establishing magnetoreception; the state labeled S is a primary candidate for being the signaling state. The results in Fig. 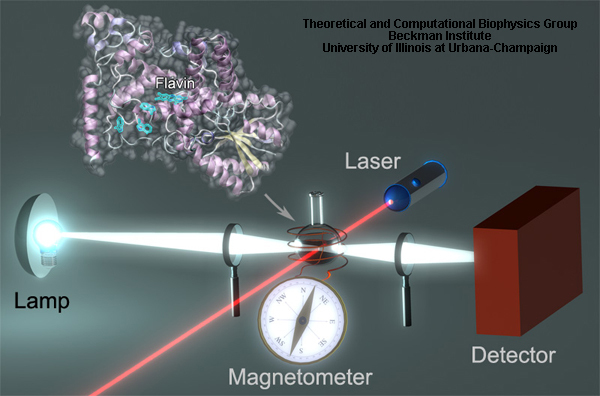 12 demonstrate that after photoexcitation a radical pair forms, becomes stabilized through proton transfer, and decays back to the protein's resting state on time scales allowing the protein, in principle, to act as a radical pair-based magnetic sensor. Fig. 12. Characterization of the cryptochrome photoreaction involving flavin, W400, and D396. (a) Calculated potential energy profiles of the key electronic states describing cryptochrome photoactivation. The energy of oxidized flavin is shown in red, excited flavin in blue, and the radical pair state RP-W400 in green. Solid circles represent computed energies, while lines show schematic potential energy surfaces. The colored background distinguishes electron-transfer (light green), proton-transfer (light blue), and coupled electron-proton transfer (pink) steps. (b) Change of electron density due to flavin photoexcitation (S0 → S1), photoinduced radical pair formation (S1 → S2(0)), and recombination (S2 → S0). The initial distribution of electron density is shown in blue, while the final distribution is shown in orange. (c) Rearrangement of the COOH- group of the D396(H) residue catalyzing the protonation of flavin by the W400(H)•+ radical through formation of a D396- intermediate (minimum S2(1) in (a)). 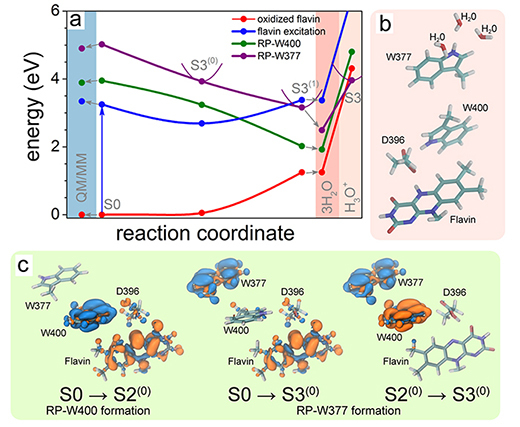 Structural rearrangement subsequent to FAD•- + W400(H)•+ radical pair formation was described through MD simulations. The formation of this radical pair was seen to trigger within cryptochrome a slight but crucial reorientation of the D396(H) residue as illustrated in Figs. 12c and 3. Prior to radical pair formation, the COOH- group of D396(H) forms a hydrogen bond with the neutral W400(H) residue with a bond length, d(HW400-OD396), fluctuating around 3 Å as seen in Fig. 13a; the O-HD396 group of D396(H) forms a hydrogen bond with the backbone oxygen atom of the M381 residue (data not shown) as also observed in the cryptochrome crystal structure. We note that a hydrogen bond between the hydrogen atom of the COOH- group and the N5 atom of the flavin group is not possible as is evident from the d(HD396-N5flavin) distance fluctuating around 6 Å, as shown in the bottom plot of Fig. 13a, due to steric constraints in the cryptochrome active site. Once flavin gains a negative charge and W400 becomes positively charged, i.e., once the FAD•- + W400(H)•+ radical pair is formed, D396(H) is seen in a second MD simulation to become involved in a remarkable structural transformation. Figure 13b shows that in the radical-pair state, two stable hydrogen bonds connecting flavin FAD•-, D396(H) and W400(H)•+, exist, resulting within a nanosecond in the d(HW400-OD396) and d(HD396-N5flavin) distances assuming average values of 2.0 and 2.7 Å, respectively. This rearrangement of D396(H) permits FAD•- protonation and W400(H)•+ deprotonation. Fig. 13. Rearrangement of D396(H) in the cryptochrome active site. 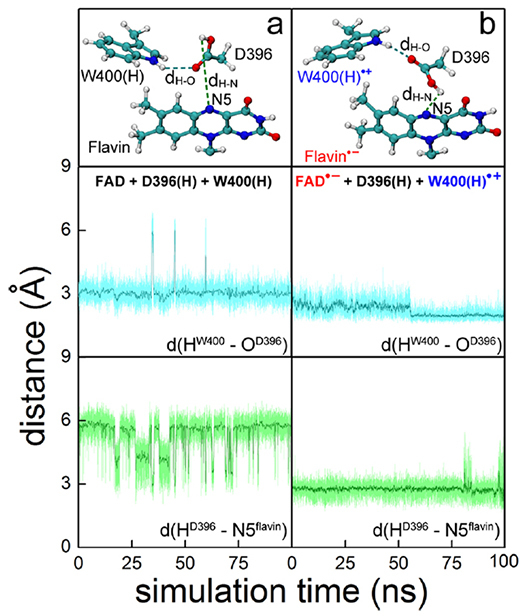 (top) Relative orientations of flavin, D396(H), and W400(H) residues obtained through all-atom MD simulations of A. thaliana cryptochrome in water for (a) cryptochrome with oxidized flavin, i.e., FAD + W400(H), and (b) cryptochrome in the radical pair state FAD•- + W400(H)•+. (middle, bottom) Time dependence of the hydrogenbond lengths d(HW400-OD396), labeled dH-O at top, and d(HD396-N5flavin), labeled dH-N at top, calculated for the two different redox states shown at top. The S2 → S0 back reaction prevents cryptochrome from reaching the millisecond-lived putative signaling state and denoted S in Fig. 11b. However, cryptochrome signaling can take place if the distance separation between the two radicals increases, namely through W377 → W400•+ electron transfer; indeed, this transfer has often be postulated. W377 → W400•+ electron transfer is feasible as long as the potential energy surfaces of the RP-W400 and RP-W377 states cross and the energy minimum of RP-W377 becomes the electronic ground state. The condition can be met since the W377 radical is solvent exposed and, therefore, can transfer a proton to the solvent, see Fig 14. Fig. 14. Electron transfer through tryptophan diad. 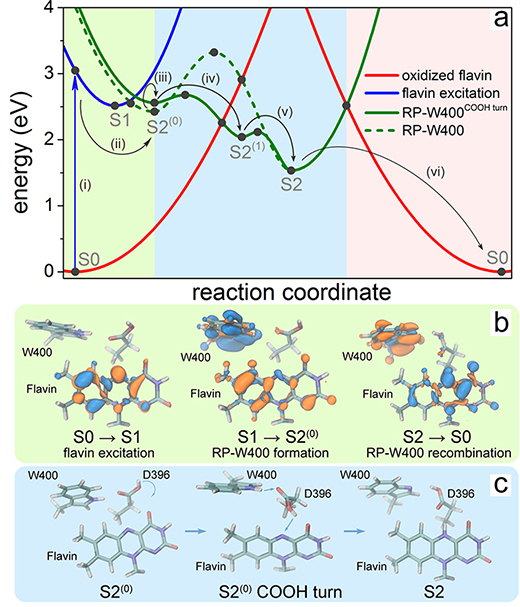 (a) Calculated potential energy profiles for the flavin-oxidized (red) and flavin-excited (blue) states and radical pair states RP-W400 (green) and RP-W377 (purple). Solid circles represent the computed energies, while lines show a schematic profile of the potential energy surfaces. The colored background highlights the results of QM/MM calculations (light blue) and the calculations that account for the presence of three water molecules around W377 (pink). (b) Active site model containing three water molecules in the W377 vicinity. (c) Change of electron density due to electron transfer from W400(H) to flavin (S0 → S2(0)), from W377(H) to flavin (S0 → S3(0)), and from W377(H) to W400(H)•+ (S2(0) → S3(0)). The initial distribution of electron density is shown in blue, and the final electron density is shown in orange. Although Fig. 14 suggests that the W377 →W400•+ electron transfer is feasible from the physics point of view, the process is expected to be slow, as the energy of the stabilized RP-W377 state is significantly higher than the energy of the stabilized RP-W400 state. The noticeable energy difference is expected to happen because the environment of the radical pair RP-W377, to a large extent, has been neglected in the calculations shown in Fig. 14. Thus, the large energy diference between the RP-W377 and RP-W400 states suggests that the W377 →W400•+ electron transfer would be outrun by flavin protonation (see Fig. 12), which is expected to happen much faster. 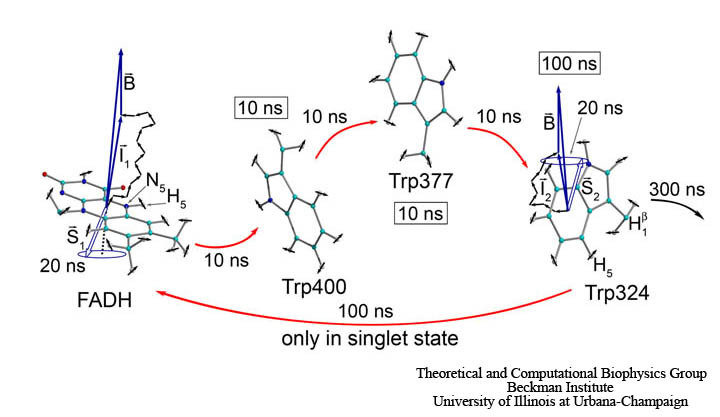 In (Solov'yov, Domratcheva, Schulten, 2014) we have studied how sequential electron transfer in cryptochrome, assisted by rearrangement of polar side groups in the cryptochrome interior, can yield a FAD-Trp radical pair state with the FAD and Trp partners separated beyond a critical distance. The large radical pair separation reached establishes cryptochrome's sensitivity to the geomagnetic field through weakening of distance-dependent exchange and dipole-dipole interactions. It is estimated that the W377 →W400•+ secondary electron transfer step can overcome in speed both recombination (electron back-transfer) and proton transfer involving the radical pair reached after primary electron transfer. In order to judge the actual rate of a W377 →W400•+ electron transfer an account of amino acids surrounding W377 is called for. Inspecting the cryptochrome structure, one identifies several polar amino acid residues that are about, 4–6 Angs. away from W377 in the equilibrated structure of the protein. These side groups could accelerate W377 →W400•+ electron transfer by rearranging themselves. Figure 15 illustrates the charge distribution in cryptochrome's active site. The polar amino acids that surround W377 are Q401, T404, and T406, while the charged amino acids, E312 and R313, are directed away from W377 and, therefore, likely irrelevant for the electron transfer rate. Fig. 15. Cryptochrome active site model. 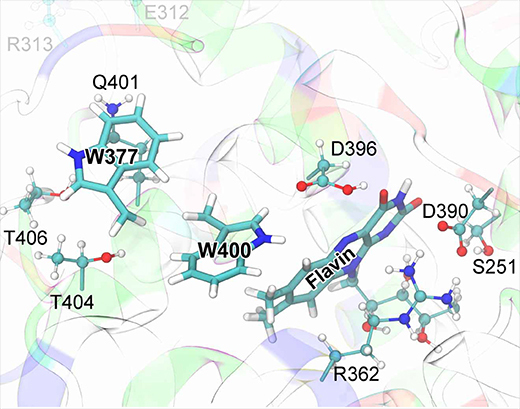 The quantum chemical description of the W377 →W400•+ electron transfer in cryptochrome includes electronic degrees of freedom of riboflavin and of the side chains of amino acid residues S251, R362, W377, D390, D396, Q401, W400, T404, and T406. Residues donating and accepting the electrons (flavin, W400, W377) are shown in licorice representation, while the atoms of coordinating side chains are shown as balls and sticks. The coloring of cryptochrome secondary structure illustrates the charge state of the protein's amino acids: positive (blue), negative (red), polar uncharged (green), and hydrophobic uncharged (white). The electronic states of the cryptochrome active site with the lowest energies are shown in Fig. 16. The energy of the cryptochrome active site with the optimized [FAD•-+W400•+] radical pair (state of optimal geometry RP-W400) is 1.32 eV lower than the energy of the active site with the [FAD•-+W377•+] radical pair, both energies calculated for the RP-W400 geometry and shown in Fig. 16. 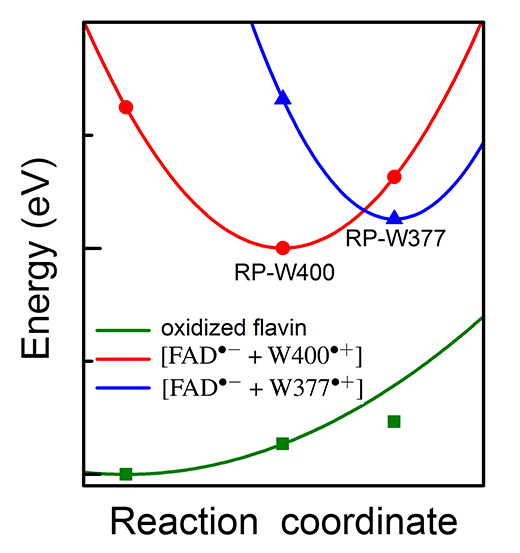 Optimization of the [FAD•-+W377•+] radical pair leads to a crossing of the energy surfaces characterizing the two radical pairs and a lowering of the energy-optimized RP-W377 state by 1.06 eV as seen in Fig. 16. The molecular environment of W377 is essential for lowering the energy of the respective radical pair. Fig. 16. Potential energy profiles of the key electronic states in cryptochrome. The energy for oxidized flavin is shown in green, for radical pair state [FAD•-+W400•+] in red and for radical pair state [FAD•-+W377•+] in blue. Solid symbols represent calculated energies, while lines represent schematic potential energy surfaces. In the present study, the crossing of the surfaces comes about through the rearrangement of W377 as well as of side groups T404, T406 and Q401 as shown in Fig. 17. The computed peaked crossing of the radical pair surfaces in Fig. 16 suggests that the respective electron transfer belongs to the regime where the activation energy hardly exceeds the driving force and, therefore, according to Marcus theory is feasible. Yet, the energy of the RP-W377 optimized state is higher than the energy of the RP-W400 optimized state by 0.26 eV. The RP-W377 optimized state is, thus, at best an intermediate state of photo-excited cryptochrome that would need to be stabilized through, for instance, deprotonation of W377•+ or further down-hill electron transfer. The formation of a short lived, metastable [FAD•-+W377•+] radical pair is, however, necessary for cryptochrome magnetoreception, as it enables a likely, subsequent W324 →W377•+ electron transfer, leading to formation of the highly separated [FAD•-+W324•+] radical pair. Fig. 17. Turn of W377 upon electron transfer. Shown is a rearrangement of the W377 residue in Arabidopsis thaliana cryptochrome, namely a turn of the side group that is coupled to W377 →W400•+ electron transfer. The turn comes about in the quantum chemical geometry optimization calculations depicted in Fig. 16 and involves also the positive W400•+ radical and the polar environment of the W377 residue made up of residues Q401, T404, and T406. A T404OG1...W377HE1 hydrogen bond (right panel, magenta) is formed upon the turn of W377. In summary, our recent studies, (Solov'yov, Domratcheva, Moughal Shahi, Schulten, 2012) and (Solov'yov, Domratcheva, Schulten, 2014), follows the molecular movement of a radical pair through cryptochrome and provides deeper insights into the origin of the mysterious magnetic sense. For example, animal cryptochromes have a slightly different structure than the plant protein, which means radical pairs in animal cryptochromes should behave slightly differently than those in the plant protein. However, a related electron transfer in the animal protein could create the stabilizing structural change needed for magnetic sensing. A chemical compass for bird navigation. Ilia A. Solov'yov, P. J. Hore, Thorsten Ritz, and Klaus Schulten. In Masoud Mohseni, Yasser Omar, Greg Engel, and Martin B. Plenio, editors, Quantum Effects in Biology, chapter 10, pp. 218-236. Cambridge University Press, 2014. Separation of photo-induced radical pair in cryptochrome to a functionally critical distance. Ilia Solov'yov, Tatiana Domratcheva, and Klaus Schulten. Scientific Reports., 4:3845, 2014. doi: 10.1038/srep03845. Decrypting cryptochrome: Revealing the molecular identity of the photoactivation reaction. Ilia A. Solov'yov, Tatiana Domratcheva, Abdul R. M. Shahi, and Klaus Schulten. Journal of the American Chemical Society., 134:8046-1805, 2012. Reaction kinetics and mechanism of magnetic field effects in cryptochrome. Ilia A. Solov'yov, and Klaus Schulten. Journal of Physical Chemistry B, 116:1089-1099, 2012. Acuity of a cryptochrome and vision based magnetoreception system in birds. Ilia A. Solov'yov, Henrik Mouritsen, and Klaus Schulten. Biophysical Journal, 99:40-49, 2010. How birds and other animals orient in the Earth magnetic field. Ilia A. Solov'yov, Klaus Schulten, and Walter Greiner. Physik Journal, 9:23-28, 2010. Magnetoreception through cryptochrome may involve superoxide. Ilia A. Solov'yov, and Klaus Schulten. Biophysical Journal, 96:4804-4813, 2009. Exploring the possibilities for radical pair effects in cryptochrome. Ilia A. Solov'yov, Danielle Chandler, and Klaus Schulten. Plant Signaling & Behavior, 3:676-677, 2008. Magnetic field effects in Arabidopsis thaliana cryptochrome-1. Ilia A. Solov'yov, Danielle Chandler, and Klaus Schulten. Biophysical Journal, 92:2711-2726, 2007. A model for photoreceptor-based magnetoreception in birds. Thorsten Ritz, Salih Adem, and Klaus Schulten. Biophysical Journal, 78:707-718, 2000. A perturbation treatment of oscillating magnetic fields in the radical pair mechanism using the Liouville equation. J. M. Canfield, R. L. Belford, P. G. Debrunner, and K. Schulten. Chemical Physics, 195:59-69, 1995. A perturbation theory treatment of oscillating magnetic fields in the radical pair mechanism. Jeff M. Canfield, R. Linn Belford, Peter G. Debrunner, and Klaus Schulten. Chemical Physics, 182:1-18, 1994. Model for a physiological magnetic compass. Klaus Schulten and Andreas Windemuth. In G. Maret, N. Boccara, and J. Kiepenheuer, editors, Biophysical Effects of Steady Magnetic Fields, volume 11 of Proceedings in Physics, pp. 99-106. Springer, Berlin, 1986. Magnetic field effects on radical pair processes in chemistry and biology. Klaus Schulten. In J. H. Bernhard, editor, Biological Effects of Static and Extremely Low Frequency Magnetic Fields, pp. 133-140. MMV Medizin Verlag, Munich, 1986. Magnetic field effects in chemistry and biology. Klaus Schulten. In J. Treusch, editor, FestkÃ¶rperprobleme, volume 22, pp. 61-83. Vieweg, Braunschweig, 1982. A biomagnetic sensory mechanism based on magnetic field modulated coherent electron spin motion. Klaus Schulten, Charles E. Swenberg, and Albert Weller. Zeitschrift fÃ¼r Physikalische Chemie, NF111:1-5, 1978. Contact Us // Material on this page is copyrighted; contact Webmaster for more information. // Document last modified on 23 Jan 2014 // .